Simon Lee Gallery is pleased to present a series of new paintings by Indonesian artist, Arin Dwihartanto Sunaryo. Argo, which translates from Japanese to ‘mountain’, is the culmination of Sunaryo’s most recent experience and exploration of the mountains of Indonesia. 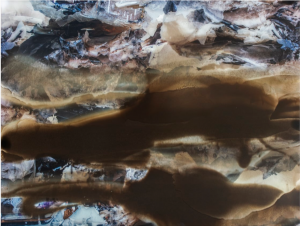 In these works, he pours volcanic ash and resin on plexiglass to create abstract compositions profoundly connected with his homeland. This will be the artist’s first solo show in the UK since 2010. Sunaryo is first and foremost a painter, dedicated to pushing the medium’s boundaries with innovative techniques. In preparation for this new series of works, Sunaryo spoke to residents of places local to the Merapi Volcano, infamous for its violent eruptions over centuries of Central Javanese history. Their emotional memories of the eruption and how it has impacted their lives and the landscape of the surrounding areas led him to source ash from volcanic mountains across Java and Bali. The intimate process of gathering anecdotes enables the artist to form a deeper connection with his native land and the materials with which he works.